Lemurian Sage™ contains 100% Pure Essential Oils of Sage, Neroli, and Orange: Dried White Sage and Sweetgrass: Crushed Crystals of Lemurian Seed and Rose Quartz in a Jojoba oil base. 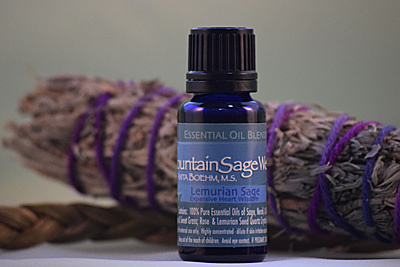 Lemurian Sage ™ Essential Oil Blend has been inspired by those connected to the energies of the people who lived on Lemuria — an ancient continent that existed around the time of Atlantis. It is said that the Lemurians lived in harmony with each other, the land, & nature; from a heart-centered place; aligned with conscious connections for their intuitive guidance & communication; & promoted unconditional love & understanding. This oil is also aligned with the energies of the LEMURIAN LIGHT ™ symbol — connecting our hearts with Unity Consciousness. Sage essential oil aids in clearing the throat chakra — the bridge between our area of consciousness & our heart center. Neroli essential oil expands the heart energies and orange essential oil centers the vibrations into a joyful blend. Dried white sage and sweetgrass are reflective of indigenous traditions of cleansing and drawing in sacred spirit energy. Crushed crystals of Lemurian Seed & Rose Quartz further connect us to the feminine, Earth, & heart energies. This symbol was created by the late Gerri Korri; a dear soul sister to me. The Mountain Sage Wellness Lemurian Sage (Expansive Heart Wisdom) essential oil blend is attuned to this symbol. This work of art is a healing tool for healing of self and humanity. LEMURIAN LIGHT© is a Sacred Geometric shape that has come to our planet to help us remember symbols. These symbols are in us and all around us. They make up our world. They help to connect us to the 6th Dimension. Our world at this time is perceived in a 3-Dimensional way but we are moving to a Multidimensional existence. As we move into this Multidimensional state of being not only will our ailments and limitations start to fall away but we will find the peace we are constantly searching for. LEMURIAN LIGHT© is a symbol that helps us to remember how we are of many dimensions and how we use energy, light, color and vibration to heal ourselves. This is important to remember as we shift and change into a new existence that we alone and as a collective create. We are shifting very quickly and for our physical bodies to keep up with all the change we will look to new forms of healing to achieve the peace we seek. Let LEMURIAN LIGHT© help you remember the geometric forms of healing and move with ease to a new place of JOY. Let LEMURIAN LIGHT© also helps you remember that you are not alone on this planet or in this universe. As the star depicts in this symbol that you, the larger star have cords of energy that go out into the universe to connect with other stars and in turn those stars connect with others and so on. Open your heart up and connect with the center of this symbol and feel the energies of love that flows through you and out into the universe to connect with the hearts of others. Know in your heart that we are all connected. So Be It!